Wanna spruce up your kitchen and improve your eating habits? We have the ultimate prize: a new induction hob, multi-function, pyrolitic oven and stylish, powerful extractor fan from Grundig. It'll be like running your own restaurant, but without the ever-present risk of bankruptcy or visits from the council's hygiene division. To enter, just turn your browser to 200 degrees, place your details in the box below, and set a timer for a month or so. The winner will be notified by email. NB: the prize does not include installation, so you'll need to do that. Full terms and conditions apply. Multi-taste technology: Grundig's revolutionary Multi-Taste technology creates culinary masterpieces all by itself, giving budding chefs a new-found freedom. Whilst hosts mingle with guests, Multi-Taste technology ensures dishes are baked to absolute perfection. There's no need to rotate dishes as additional holes on each side of the cavity blast hot air uniformly through the oven. What's more, with air circulating horizontally on each level, the Multi-Taste oven can cook up to five different meals simultaneously without the flavours and aromas mixing. Chef Assist: The intuitive Chef Assist programme automatically selects the correct temperature, duration and cooking function, offering up to 50 pre-programmed recipes. Meat Optimiser: Select rare, medium or well done via the control panel and simply attach the Meat Optimiser to your oven cavity and set the temperature according to how you like your meat cooked. Self-Clean: The innovative built-in Pyrolytic self-cleaning option boosts your oven's temperature to an intense 480°C. Reducing all grease, stains and burns to dust that you simply wipe away with a damp cloth. This Grundig oven features two self-cleaning options, one for heavily soiled interiors (120 minute cycle) and an Eco cycle (90 minute cycle) which can save you up to 25% in energy. Cool Touch Door: Four layers of glass ensure the temperature of the oven door does not exceed 70°c, even when the heat inside the oven reaches 500°c. In fan heating, the oven door temperature is lower than 40°c. Capacity: 75 litres of useable oven capacity. It is one of the biggest on the market with an overall gross capacity of 89 litres without the trays and racking. This 60cm wide induction hob includes 2 flexi zones which adapt to the size of your pan, saving you energy. You don't have to wait too long for the hob to heat up thanks to the Booster function which allows you to get started right away. This hob features a timer so you can move freely while your food cooks. With 19 adjustable power levels per zone, you can cook your favourite meals without hassle or worry. Select the correct power level that best suits what your cooking. 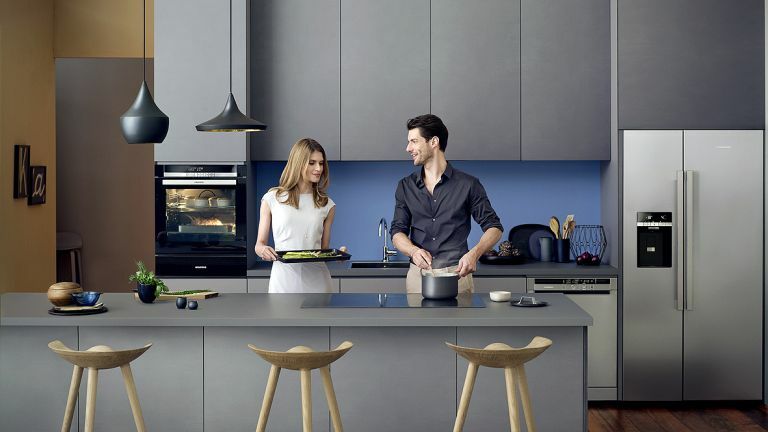 Winner can select their cooker hood from Grundig's fine selection of suckers.